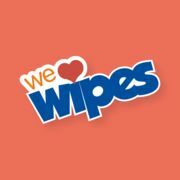 We Love Wipes is a campaign about celebrating…wipes. We Love Wipes is about celebrating what wipes do for us everyday, how they help us and to educate consumers on the many different types of wipes and uses. Like to ensure people know there are only a few types of wipes that can be flushed. That’s important to know.